As I write this, my three-day weekend is over, it was so nice having that extra day off. I think I should have a 3 day weekend every week. Wishful thinking! Well today’s recipe is fun one! But first let me tell you about the Holiday Recipe Blog Hop. This blog hop is sponsored by the Big Fat Baker. Today’s hop is about Mardi Gras, we had a choice of using one or all of the following ingredients: bourbon, bananas and andouille sausage. Well I always do banana so I thought I would try something completely different and off I went to buy a bottle of Jim Beam Kentucky Bourbon. I actually made two recipes using it, a wonderful Filet Mingon marinated in Bourbon, which was so tender and delicious, I’ll share the recipe with you below, but my pictures didn’t turn out well. I really can’t photograph meat. But what the heck, I’ll give you one picture, but later. But my Holiday Hop recipe is Bourbon Balls. 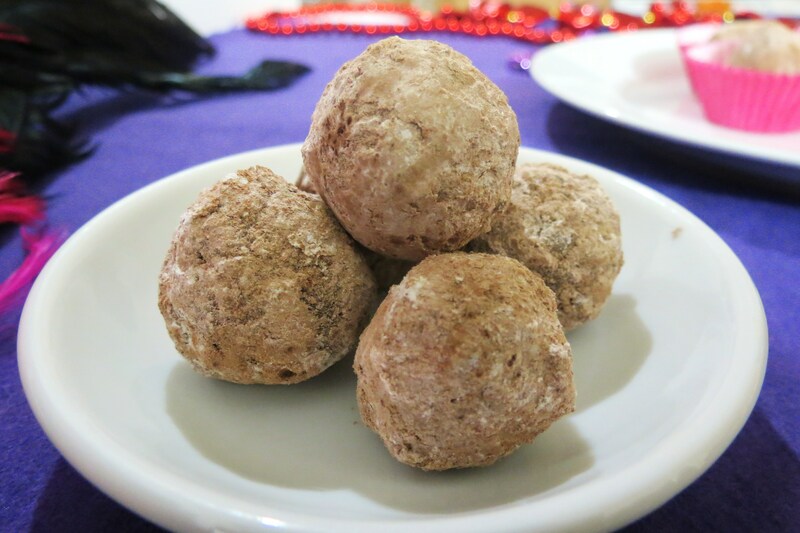 I have never had a Bourbon Ball and boy was I missing out! These are amazing!! Chocolaty, nutty and leaves a warm feeling in the belly! I love it! These could be dangerously addicting!! 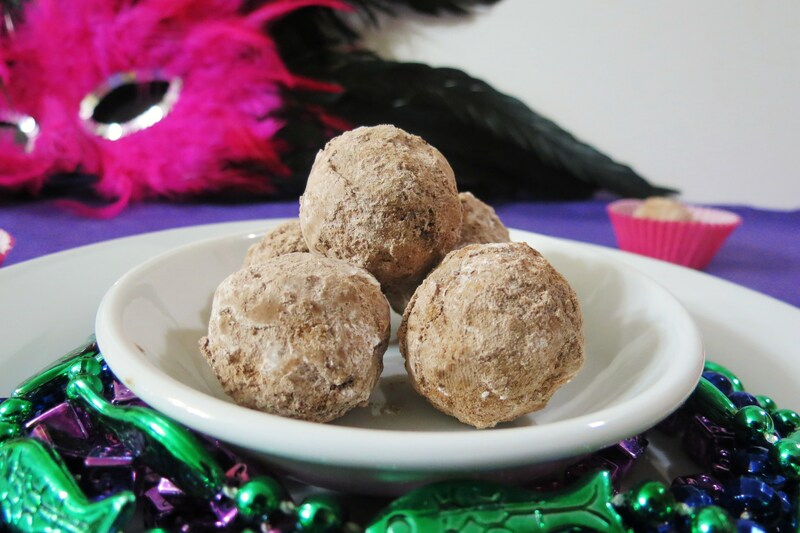 Bourbon Balls are really easy to make and only include 6 ingredients and you don’t have to bake them. I wasn’t sure, but I have been storing them in the refrigerator and everyday the flavors get a little stronger. 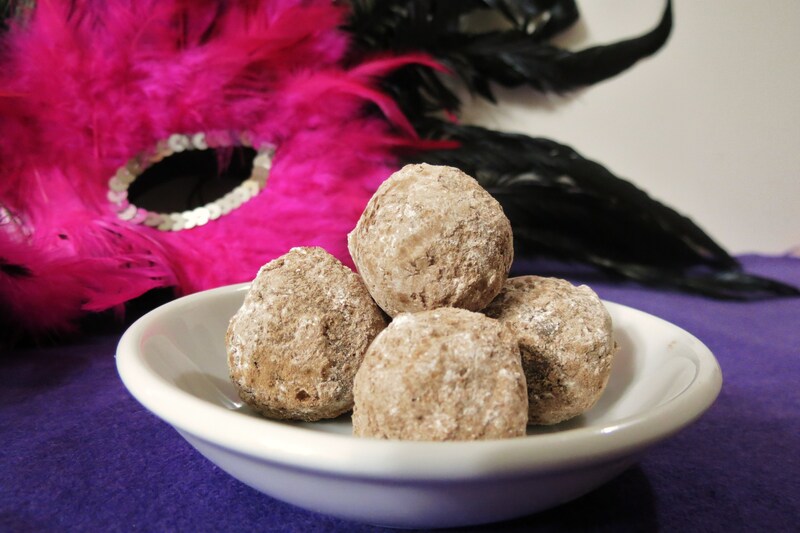 If you never had a bourbon ball you have to try them at least once. If you don’t have bourbon, I would think rum would work too, then they’d be rum balls, nope I never had one of those either. A week before Katrina hit, my Mom and Dad went to New Orleans and they gave little Jenny the mask and beads, their perfect for this holiday hop! I love all the festive bright colors! Do you celebrate Mardi Gras? I never have, but this year I will! Spread the pecans on a cookie sheet, and place in the oven for 3 minutes. For even toasting, turn the tray, front to back. Toss the nuts with a metal spatula and bake for another 3 minutes. You’ll know they’re done when they give off their fragrant aroma, and be sure to check them so they don’t become overbaked or charred. In a food processor, chop the vanilla wafers into crumbs. Add the pecans and process just until they are finely chopped. In a medium bowl, mix together the crumb-pecan mixture, 1/4 cup of the cocoa, and 1/4 cup of the confectioners’ sugar. Add the corn syrup and bourbon. Mix thoroughly. Sift the remaining 1/4 cup cocoa and 1/4 cup confectioners’ sugar onto a large plate. 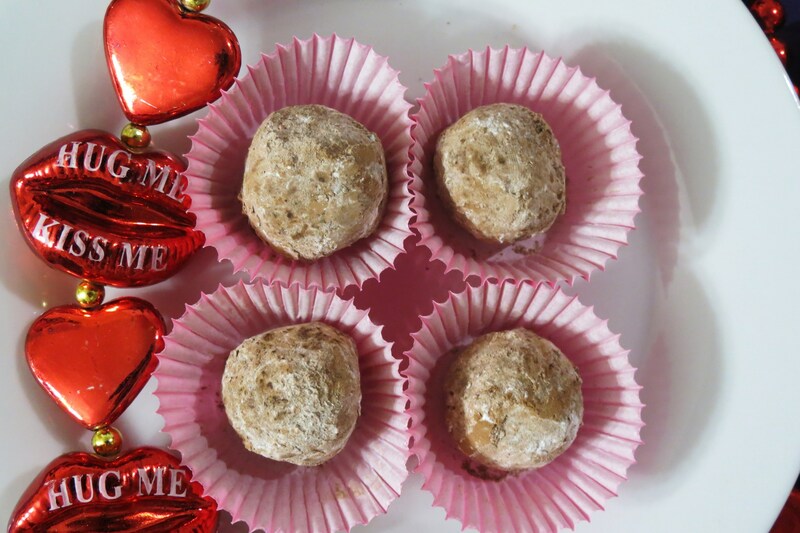 Form the crumb mixture into 3/4-inch balls and roll them through the cocoa-sugar to coat. Store in a sealed container for up to 5 days. If necessary, touch them up with a light dusting of the remaining confectioners’ sugar. Not bad calories for a Bourbon Ball! I’m pretty stoked, so I don’t feel guilty eating a couple! There perfect hitting that sweet tooth!! I almost forgot, here is the Bourbon Steak recipe. You should try it. I never had such a tender steak. Place steak in a large shallow dish. Combine remaining ingredients, stirring well. Pour over steak; cover and marinate in refrigerator 4 hours, turning steak occasionally. Drain steak, discard marinade. 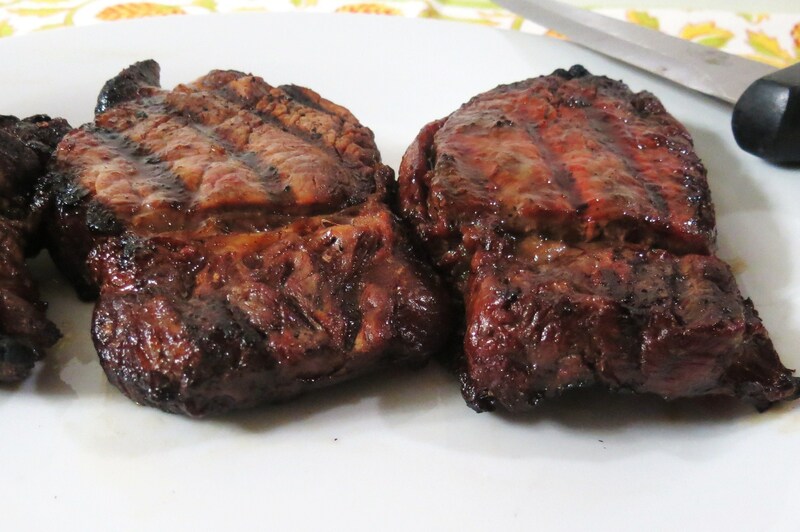 Grill steak over hot coals 7 to 10 minutes on each side or to desired degree of doneness. Let the steak sit for 10 minutes. To serve, slice steak across grain into thin slices. Here’s a picture, not pretty, sorry, but hey I’m not a photographer, I just like to eat! Make sure you check out all the recipes in the Holiday Hop. I can’t wait to see what everyone made. I wish the collection would show on my page, but wordpress won’t allow it, stinky, so just click the link below! Have a great Fat Tuesday!!! Be sure to get out there a celebrate and if you are unsure what to make, check out my Jambalaya! Perfect for Mardi Gras and it’s a one pot meal, easy to make! these sound amazing! happy mardi gras! Happy Mardi Gras and Fat Tuesday to you!! you had me at bourbon! My wife and I went on our honeymoon to NOLA so Mardi Gras time makes me think back to that time. Awesome and wild place for sure! I’ve never been to New Orleans, but it is on my Bucket List for places to go and see. I can imagine how crazy Mardi Gras would be, but I bet it is so much fun! Oh wow, this looks amazing!! Happy Fat Tuesday! 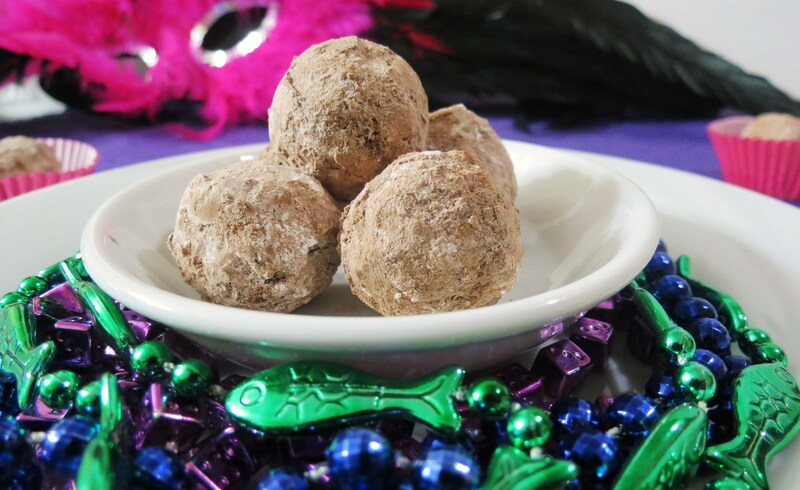 I think bourbon balls are an excellent way to enjoy the festival! Happy Fat Tuesday to you Laura! Both your Bourbon balls and marinated steaks look fantastic. I’m sure that both are addicting! This was such a fun theme and I thoroughly enjoyed my first time with the Holiday Recipe Club, the recipes shared are all mouth-watering. Now following you and so glad to have found you thru the HRC! I know, this was a fun theme, can’t wait to see what we have to do next. Welcome to the Holiday Recipe Club, glad you joined and I’m happy to meet you! Thanks Tom, best of wishes to you! These wouldn’t last long if they were in the vicinity of me. You’ll have plenty of Bourbon left over, make both. I need to figure out what else I can make with it!! 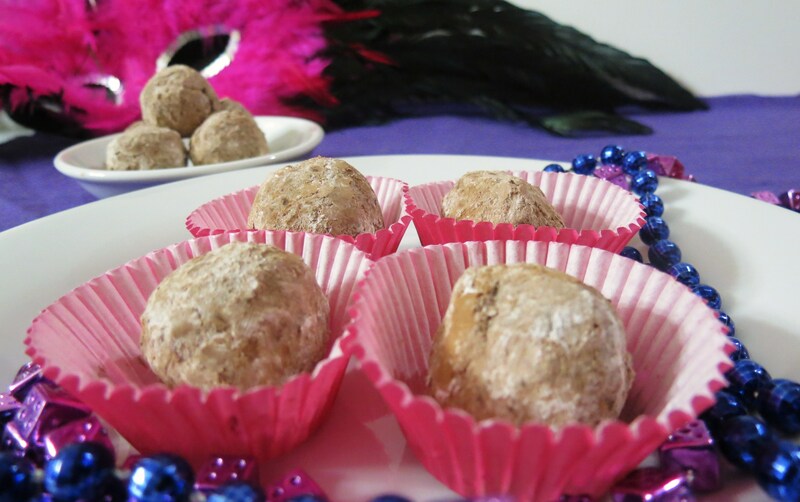 Bourbon balls look amazing and the picture of the meat is good too…. I’m glad you had fun on your 3 day weekend! 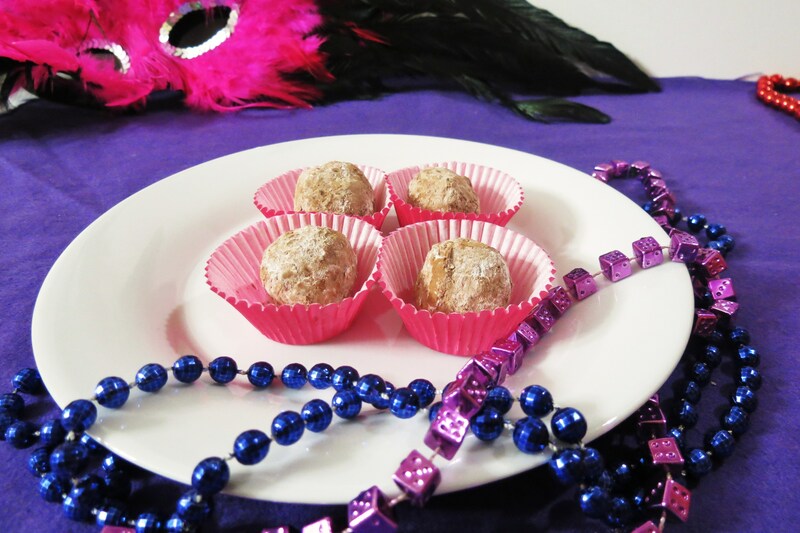 The bourbon balls look terrific….and you made the photos SO festive! …and the steaks? Oh, MY! They look amazing! I had fun with this holiday blog hop. I like when I have time to dress up my photo’s and Mardi Gras was a fun theme. Oooh I don’t think I’ve ever had a bourbon (or rum!) ball before, but they sound amazing. And even better, no baking necessary! I love your bourbon marinated meat too, great idea. Thanks! I have to say I have a new love for Bourbon! It’s fun to cook with! Ohmy goodness 🙂 everything in this post looks amazing 🙂 Mmmmm!